I’ve been working quietly behind the scenes on a new design for a project bag for portable crafts, and couldn’t do it without the expert guidance of a professional seamstress like Pauline Van Gulden. Pauline was kind enough to sit down with me for a chat about her career and approach to designing. Some of Pauline’s favorite collaborations remind me of a bygone era, when folks would have had each item made for them before off-the-rack clothes were available. You go into a tailor’s workshop, choose fabric, discuss fit and style, and have the clothes made to suit your body and your personal taste. Pauline enjoys this type of collaboration with her clients too, who get to choose quality fabrics for pieces that will last for decades longer than typical store-bought items. 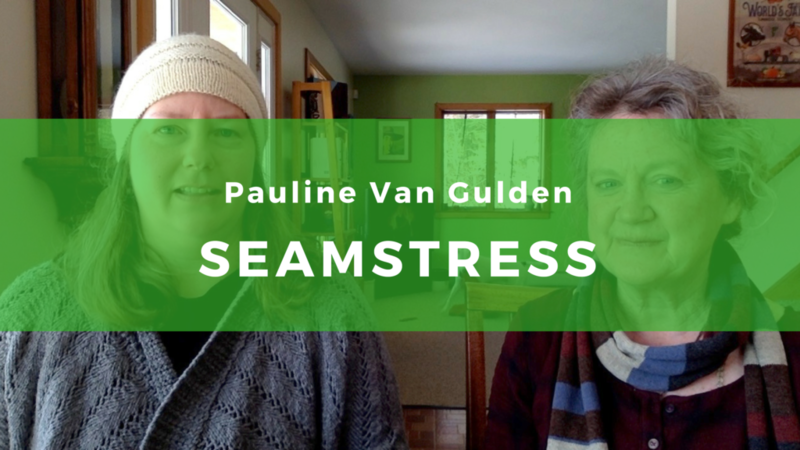 Pauline doesn’t have a website or other social media accounts for her sewing business. However, if you are looking for someone to work with on a production project, or perhaps a tailor-made version of a favorite piece in your wardrobe, we can put her in touch with you directly.